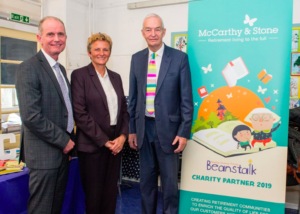 Recently, I had the pleasure of celebrating a new collaboration between Beanstalk (a charity for helping to get kids reading) and McCarthy & Stone (a retirement house builder). It was an ideal opportunity for me to meet some Beanstalk volunteers, as I have been considering becoming a volunteer myself. 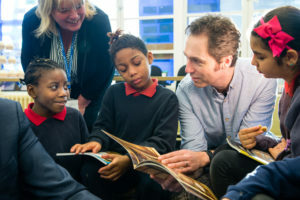 They all spoke so positively about their experiences of reading one-to-one with pupils who are struggling with reading. I was one of those kids myself. Reading was extremely hard work when I was young and as a result I didn’t read much at all. I certainly never read at home or for my own pleasure, which is something I wish I had done. 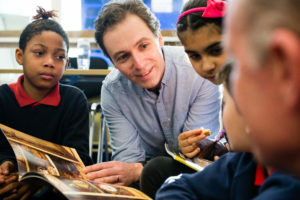 I’m busy catching up on all the wonderful children’s books now, but feel like I missed out on so much of the magic of a young reader getting lost in an amazing story. 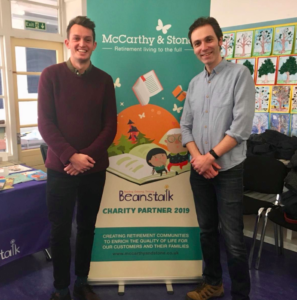 It was a lovely morning where I also got to meet the wonderful Beanstalk staff and author – and Beanstalk volunteer – Matt Oldfield, who writes fantastic football stories. 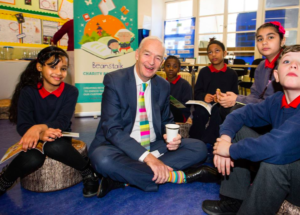 There was also a chap called Jon Snow – Channel 4 News legend!! He was a real gent. It was brilliant to have such an esteemed reader supporting the event. And his socks were just as jazzy as his tie!! As for myself – yes, I have started the process to become a volunteer. I’m excited and also nervous. But really looking forward to it. Hopefully, I’ll help young readers, like myself, to discover the pure joy of reading.